No, that's not an euphemism. Designer, Michael William Lester's portfolio is really tiny. But hey, it's not the size that matters. 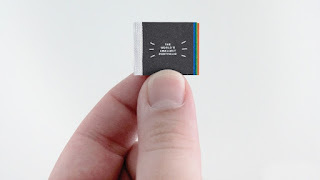 He created the world's smallest portfolio to showcase his work in a very unique way. Certainly a great way to stand out from the crowd and get people talking about you. Well done sir. Probably he should be providing a magnifier while presenting is portfolio. It takes a lot from him to work on this.